Right now I'm sitting at my desk working on this and that for the blog (and obviously getting this post ready!) listening to the insane amount of rain that's going on outside. First of all, it's a miracle that I am working at my desk at all. My desk growing up was more so a hoarding zone for everything that occurred during my life starting from age 8. It wasn't until I had a completely empty desk again in college that I decided, ok maybe I can do this desk thing. Once I graduated, I cleaned up my desk at home, removed the bar mitzvah photo booth pics, the old birthday cards, etc., and now I use it as my "office." My bed is still two feet away from my desk, so I guess it's kind of like college still. But don't worry, this recipe is nothing like the pizza you had in college. Unless you were part of some food-op situation, in that case I am incredibly jealous. 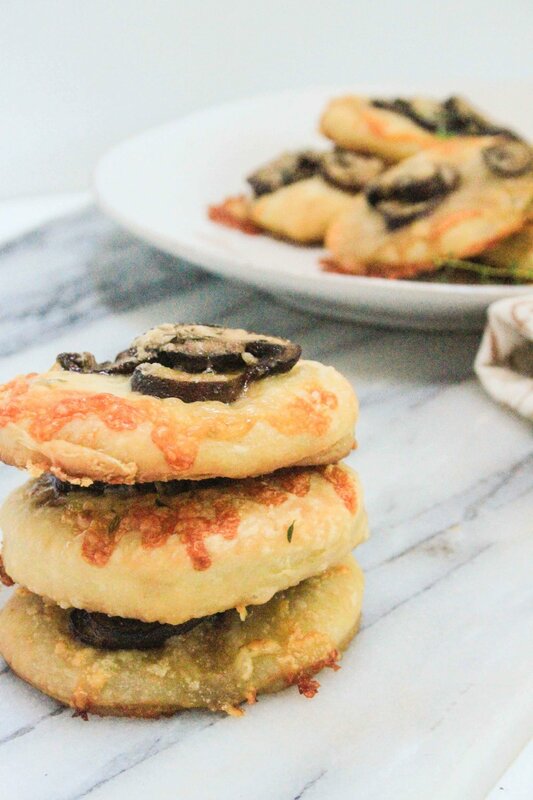 These mini pizzas are inspired by these pizzettes by Giada De Laurentiis, but no there is no kale over here. Instead it's all about the mushrooms. Also two of my favorite cheeses, parmesan + superrr sharp white cheddar. They're super easy to make, seem impressive + taste just like cheesy bread. Toss the mushrooms with a drizzle of olive oil + a pinch of salt salt on parchment-lined baking sheet. Roast the mushrooms in the oven for 10 minutes. Set aside. Raise the oven to 350 degrees Fahrenheit. On a floured surface roll out the pizza dough until thin. Use a cookie cutter (or drinking glass!) to cut out 12 circles from the dough. 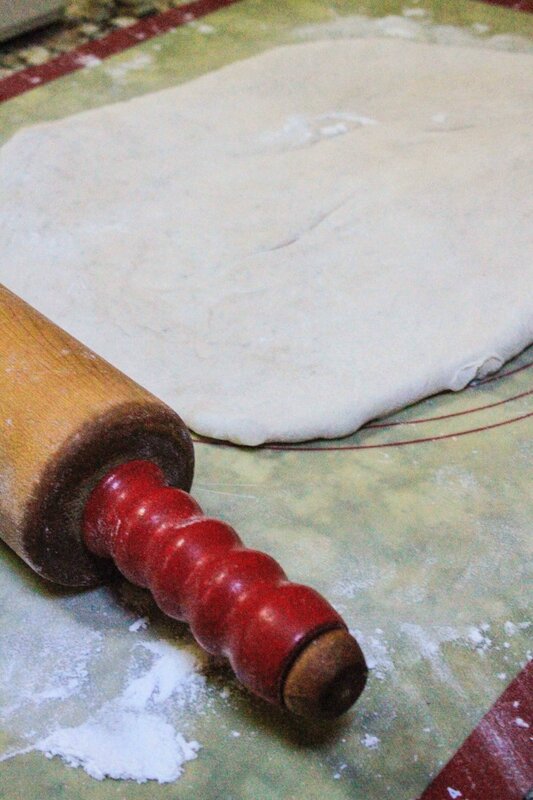 You may have to re-roll to use up all that dough. Line two baking sheets with parchment and drizzle some olive oil on both. Lay six pieces of dough on each baking sheets, equally spaced out. Assemble each pizza: drizzle some olive oil on top of the dough, top with a tablespoon of cheddar, a scoop of the mushrooms, 1/2 teaspoon parmesan cheese + a few fresh thyme leaves. 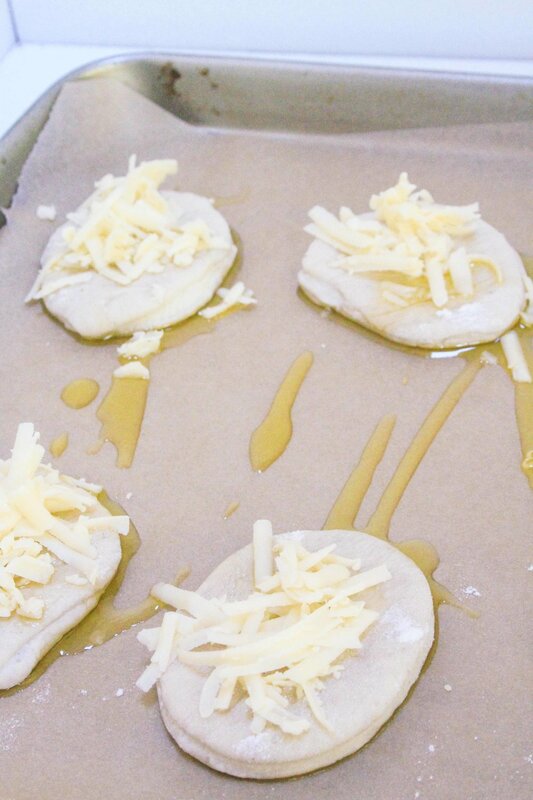 Bake the pizzas in the oven for 15 minutes until golden. Remove + enjoy right away.